Banner Batteries has brought the curtain down on what it claims was a perfect recipe for success – its 2018/19 winter ‘The Great Banner Scratch Off’ promotion. 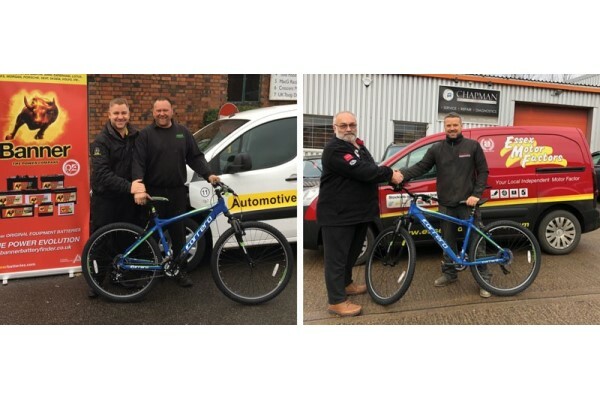 Having proved a real showstopper, two lucky winners – one from a customer of Essex Motor Factors and Westleigh Motor Factors of Hants – each rode off with the top tier prize of an electric maintain bike. This left several others travelling in their wake on a traditional pedal-powered mountain bike, having also successfully received a lucky winning srcatchcard. These went to customers of Charles Hurst Ltd of Belfast, Wales-based E & M Motor Factors, Millfield Autoparts of Peterborough, and Shepshed Auto Supplies, whilst north of the border saw D & A Factors of Dundee also feature. Not content with seeing a customer go electric, it was a double winning performance from Essex Motor Factors.